You probably don’t need the lesson, but here’s how the filibuster works. A nomination or bill is produced. If 60 senators don’t agree to proceed to a vote, there’s no vote. You might forget this when you read headlines like “GOP senators say they would try to block Rice nomination” and “GOP opposition to Rice nomination mounts.” U.N. Ambassador Susan Rice is tipped as a possible candidate for secretary of state, and some Republicans refuse to consider her because, frankly, they want a scalp in the Benghazi debacle, and David Petraeus’s scalp doesn’t count. But it’s “some” Republicans. The key to this story is how Sen. John McCain, whose presidential candidate lost an election eight days ago, is using his media clout to create problems for Rice and the president. Reporters cover whatever McCain does. This morning, in a Fox News interview, he pledged to filibuster Rice. 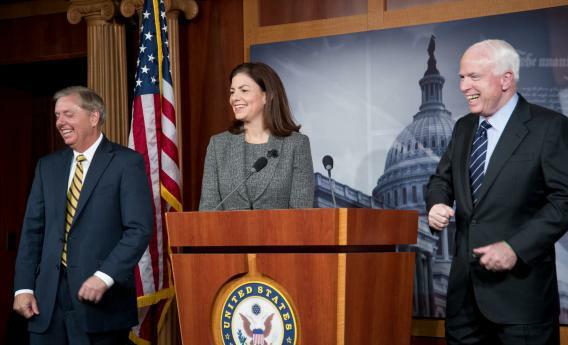 Hours later he called a news conference with Sen. Lindsey Graham (who has also promised to filibuster) and Sen. Kelly Ayotte (who has become the new Joe Lieberman of the McCain-led three amigos.) McCain pledged to “do whatever to block the nomination that is within our power.” On the way out, I heard reporters confidentially talking about how the president had to “pull” Rice—who has not been nominated—because of the opposition. But to filibuster Rice, Republicans would need 40 votes. Neither McCain or Graham said they had those votes; Graham just speculated that “a few” Democrats might buck the president on his own secretary of state nomination and join a filibuster. Few other members of the GOP conference have promised this level of opposition. McCain’s obvious contempt has been noticed by the press and dismissed by Democrats. After McCain’s presser, where he called for a select committee to investigate Benghazi, a reporter asked Sen. Harry Reid whether he could support such an investigation. “No,” snapped Reid. Ironically, McCain’s zealousness and insistence that Democrats have lied and covered up facts about the death of Americans might be an impediment to an anti-Rice campaign. What, exactly, do Democrats gain if they punt Rice? If she’s passed over, it looks like Republicans scared the re-elected president out of a choice he wanted to make. And Republicans will grill her over Benghazi anyway. Eight years ago, Democrats tried a version of this play with Condoleezza Rice. She’d been the president’s national security adviser during a period of stunning intelligence failures. Liberals blanched at the idea of promoting her and wanted to make George W. Bush suffer for it. But in the end, 30 Democrats voted to confirm the Original Rice. Among them: Joe Biden and Barack Obama. They were spared the scorn of a Republican senator who endorsed Rice and accused her opponents of being sore losers.